The recent furore following the desecration of Dr Bhim Rao Ambedkar's statue in Bombay has largely been interpreted as the resurgence of the dalit movement in India. A phenomenon which first saw its genesis in the philosophy and personality of Dr B R Ambedkar 50 years ago. In his latest book, Worshipping False Gods, Arun Shourie challenges Dr Ambedkar's contribution to Indian Independence. The book has already run into controversy and several dalit organisations in Maharashtra want it banned. Ambedkar's public life begins in a sense from a public meeting held at the Damodar Hall in Bombay on March 9, 1924. The struggle for freeing the country from the British was by then in full swing. Swami Vivekananda's work, Sri Aurobindo's work, the Lokmanya's work had already stirred the country. Lokmanya Tilak had passed away in 1920. The leadership of the National Movement had fallen on Gandhiji. He had already led the country in the Champaran satyagraha, the Khilafat movement, in the satyagraha against the Rowlatt Act, against the killings in Jallianwala Bagh and the merciless repression in Punjab. This National Movement culminated in the country's Independence in 1947. In a word, a quarter century of Ambedkar's public career overlapped with this struggle of the country to free itself from British rule. There is not one instance, not one single, solitary instance in which Ambedkar participated in any activity connected with that struggle to free the country. Quite the contrary--at every possible turn he opposed the campaigns of the National Movement, at every setback to the Movement he was among those cheering the failure. Thus, while the years culminated in the country's Independence, in Ambedkar's case they culminated in his becoming a member of the Viceroy's Council, that is -- to use the current terms -- a Minister in the British Cabinet in India. The writings of Ambedkar following the same pattern. The Maharashtra government has by now published 14 volumes of the speeches and writings of Ambedkar. These cover 9,996 pages. Volumes up to the 12th contain his speeches and writing up to 1946. These extend to 7,371 pages. You would be hard put to find one article, one speech, one passage in which Ambedkar can be seen even by inference to be arguing for India's Independence. Quite the contrary. Who is pleading thus to whom? It is B R Ambedkar writing on 14 May 1946 to a member of the (British) Cabinet Mission, A V Alexander. Nor was this a one-of slip, an arrangement crafted just for the occasion. Indeed, so long as the British were ruling over India, far from trying to hide such views, Ambedkar would lose no opportunity to advertise them, and to advertise what he had been doing to ensure that they came to prevail in practice. Among the faithful his book What Congress and Gandhi Have Done to the Untouchables is among the most admired and emulated of his writings. It was published in 1945, that is just two years or so before India became Independent. As we shall see when we turn to Ambedkar's views on how harijans may be raised, it is an out and out regurgitation of the things that the British rulers and the missionaries wanted to be said, of the allegations and worse that they had been hurling at our civilisation and people. The book has been published officially by the education department of the government of Maharashtra, and is sold at a subsidised price! 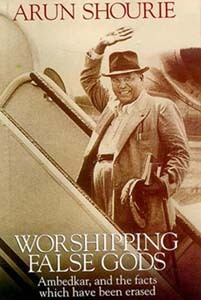 It constitutes Volume IX of the set Dr Babasaheb Ambedkar, Writings and Speeches. It reproduces the speech Ambedkar made at the Round Table Conference -- a speech which served the designs of the British rulers to the dot, and for which, as we shall soon see, they were ever so grateful to Ambedkar for it became one of the principal devices for thwarting Gandhiji. In the speech Ambedkar addresses the prime minister and says, "Prime minister, permit me to make one thing clear. The depressed classes are not anxious, they are not clamorous, they have not started any movement for claiming that there shall be an immediate transfer of power from the British to the Indian people.... Their position, to put it plainly, is that we are not anxious for transfer of power from the British to the Indian people.... Their position, to put it plainly, is that we are not anxious for transfer of political power...." But if the British were no longer strong enough to resist the forces which were clamouring for such transfer, Ambedkar declared, then his demand was that they make certain arrangements-- arrangements which we shall encounter repeatedly in his speeches and writings, the essential point about which was to tie down the new government of Independent India.